Today we were all about soaking up the sunshine. The past few days have already been in the 90’s. Something that usually doesn’t happen in our neck of the woods until late June/early July. So we briefly thought about not attending this weekend’s River Rock festival in the capital city. Needles to say, that although we’re all exhausted after walking several miles, over several hours, we are so glad we went. The hottest it got was a comfortable 79 degrees, and even though there was plenty of direct sunlight– there were also plenty shady spots. The constant breeze off of the river was heavenly. Before we were even aware of it, hours had gone by spent spasjing in the water, crossing the new bridge that spanned the whole river. It had to have been close to a mile. Watching dogs jump an impressive twenty some feet out over water after their parents threw toys to fetch. High flyer’s, indeed. We saw slackline competitions, bouldering, and checked out vendor after vendor– even grabbing lunch from our local food truck. It was great. We felt great, even on the long walk back to the car. It wasn’t until we settled into our bucket seats that exhaustion caught up with us. And oh boy, did it ever. I think we were all ready for a nap. Sadly, we still had to make it home. And while home was only a twenty minute drive, it seemed so far at the time. Obviously, we made it– or I wouldn’t be here sharing another new recipe with you. I’ll tell you what though, after dragging ourselves inside I don’t think I’ve ever been so happy in all my life to have made a meal ahead of time. Everyone was starving. Everyone was crabby. Guess you could say we were all a bit hangry. No one wanted to cook. 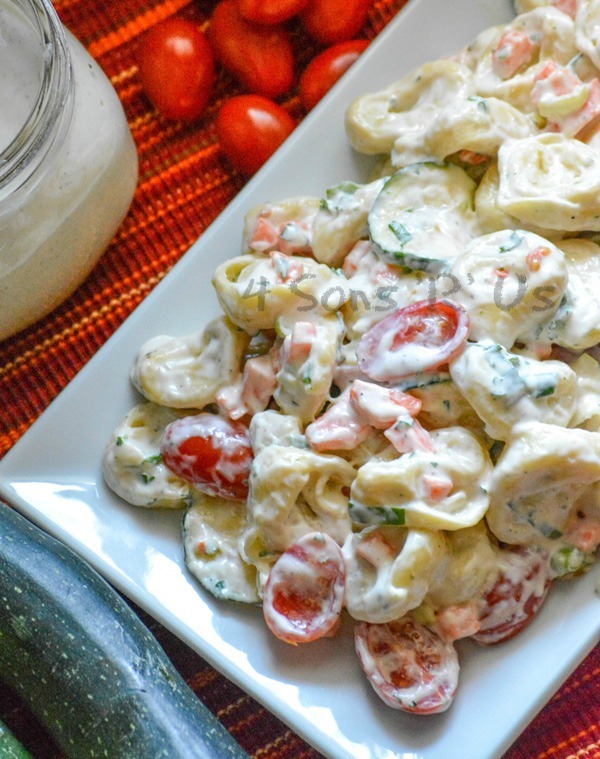 Luckily, I was able to reach into the fridge and pull out a tub of my Summertime Tortellini And Vegetable Pasta Salad. Within minutes I had scooped everyone a generous bowl full, and we all settled in and was quite happy within a few minutes. 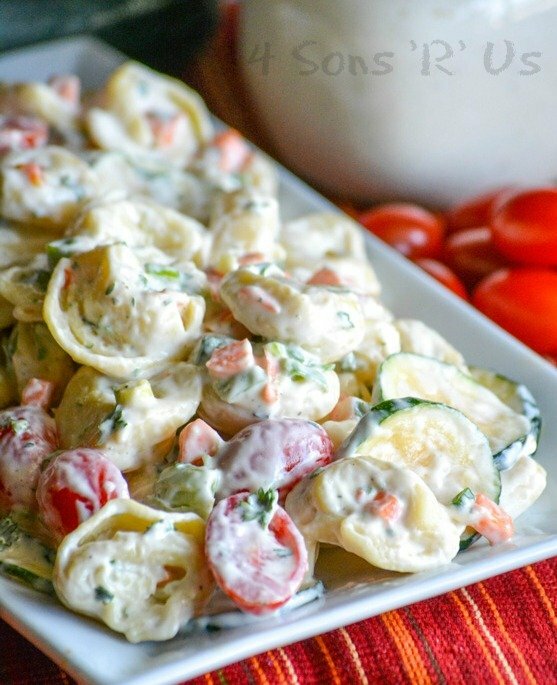 Light, but totally filling– this Summertime Tortellini And Vegetable Pasta Salad is cool, crisp and refreshing. 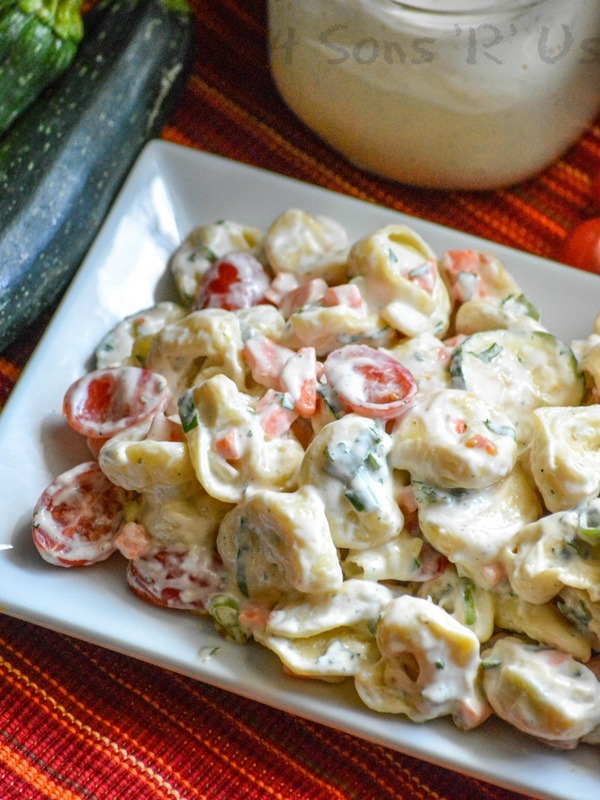 Packed full of cheese-stuffed tortellini, and bright Summer veggies like grape tomatoes, carrots, zucchini slices, spring onions- this bright, beautiful pasta salad is tossed with grated Parmesan cheese and creamy ranch dressing. It’s bold, it’s beautiful, and it’s really pretty to me since it’s quick and easy enough to whip up anytime. Before or after an event, this salad is there for me as a go-to meal. 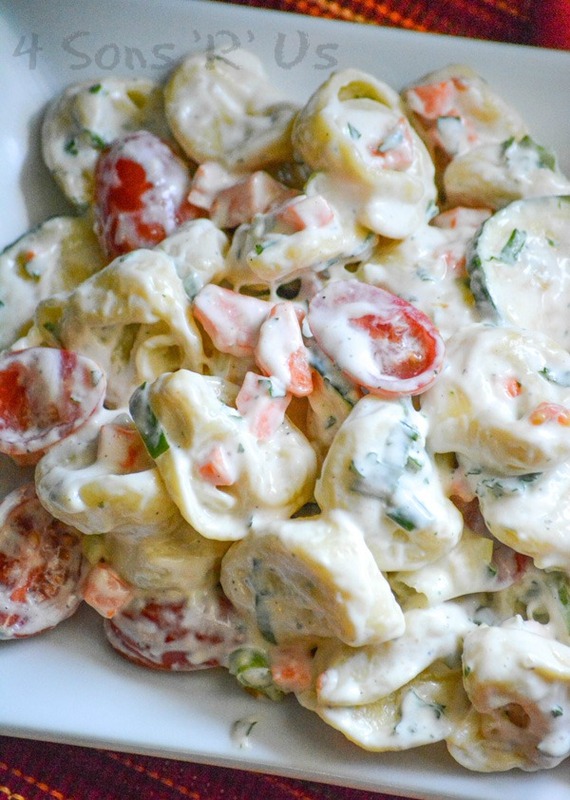 All hail, the gorgeous recipe that is Summertime Tortellini And Vegetable Pasta Salad. And trust me, despite how it looks, it is NOT to pretty to eat. 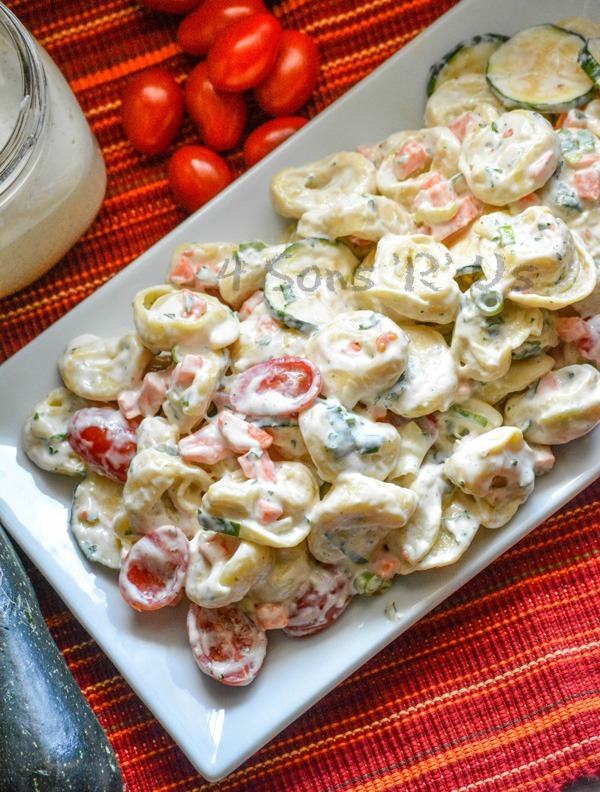 A fresh pasta salad that's as bright to behold as it is to dig into-- this tortellini version is chock full of Summer veggies and tossed in ranch dressing with a dash of grated Parmesan. Cook the pasta according to the package directions. Drain, and rinse under cold water until cool to the touch. Transfer to a large mixing bowl. Add in all the veggies. Stir in the dressing and cheese, gently tossing until everything's evenly combined. Chill for 2 hours, or up to overnight, before serving. Perfect party food – thanks for bringing to Fiesta Friday! My mouth is watering! This salad sounds so refreshing and delicious!